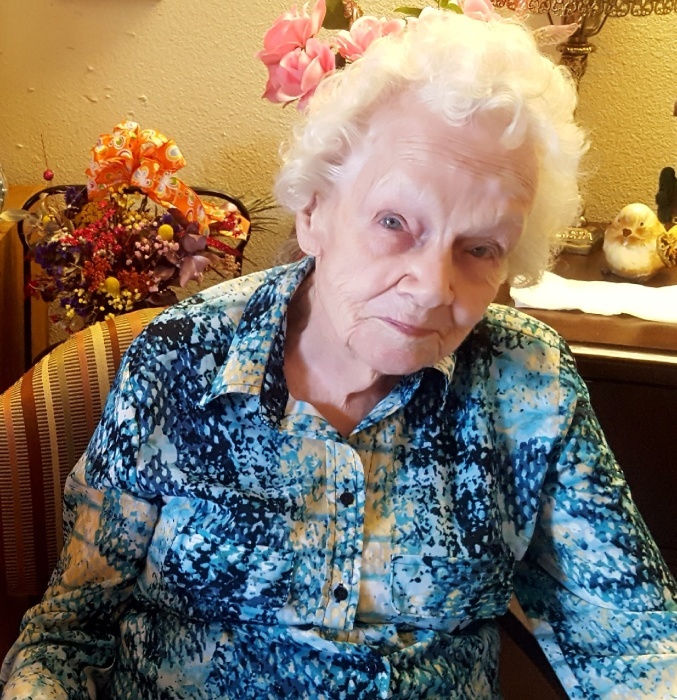 Blanche Dornan, 103, who called New Cumberland, WV home for 98 years, passed away at her son’s residence among family in Stephenville, TX on January 28, 2019. Blanche was born August 2nd, 1915, in New Cumberland, WV to John & Ada Gibson. She married Wayne “Snook” Dornan November 23, 1935. They had one son, Robert “Skip” Dornan. Blanche was a homemaker and loved her house, which sat atop a picturesque hill surrounded by rolling meadows and towering oaks. She enjoyed sitting in her rocker looking out the picture window watching the red birds and squirrels, while her stereo cabinet played old Jim Reeves, Charlie Pride, and Merle Haggard vinyl. In the summertime, Blanche would tend to her vibrant flower gardens and rhododendrons, which adorned the entire perimeter of her house and porches. She decorated her home with such beautiful furnishings and decor, that once, a young boy visiting with his mother, asked if they were in a gift shop. She loved working on punch work (needlepoint & embroidery), many of which were displayed throughout her home, and attending craft shows. Blanche was also a wonderful cook and baker. She was especially known for her homemade rolls, sugar cookies, and apple pie, the likes of which could never be duplicated. Her beautifully decorated birthday cakes were always a family favorite. Blanche “Gram” Dornan leaves behind her son, Skip & wife Eve; grandchildren, Stacey & husband Ron, Jody & husband Schonny, Blu & wife Tiffany; great granddaughter Tiffany & husband Jaremy; brother Jack; niece Rone & husband Ted; and numerous extended family. She is preceded in death by her husband Wayne “Snook”; two brothers, Jim & Bill; and five sisters, Alice, Anna Mae, Jane, Edith, and Ruth. At Blanche’s request, she will be privately laid to rest at Union Cemetery, New Manchester, WV among the tranquil rolling hills, whispering trees, and curious wildlife.